Have you ever heard of the saying “a business without a sign is a sign of no business”? Every business establishment needs to let their existence be known to the entire world. Otherwise, nobody will come in and the business will shut down. The best way to call the attention of potential customers is to put up some sort of signage. You have to let the people know the name of your establishment, the services you offer, and the works. And since we are living in the age of digital advancement, how about taking advantage of the technological world and putting up digital menu boards? With the modern advances in technology, possibilities are limitless! You have to be very specific because everything is now customizable. Which also means that your options are also endless. Before you get excited and jump into this century, here are a few things you have to think about before putting up digital menu boards. To help you figure out which one works best for your restaurant, consider asking questions like where do you intend to set it up, or do you even have an area to put up your digital signage? Do you want it to be interactive or just informative? It is also important to decide on whether you want to put your signage up indoors or outdoors, the type of lighting you have or need in your restaurant, and if you can accommodate a full-blown signboard above your entrance or cashiers. If you don’t have much space and your target market are always on the go anyway, then you can consider making it mobile too. Is your audience young or more matured? Are they always moving? Are they mostly women or are they mostly men? Do they speak slangs or are they more into the business class? This is one of the more challenging parts of preparing for a digital signage. Knowing who your audience is and what your audience wants. You have to pick the brain of your customers. You have to do research, statistics, and demographics. In short, for you to come up with an effective signage, you will need a deeper understanding of your audience and figure out what they really want to see. Of course, you have to think about what you want to say and how you’re going to say it. This means you also have to learn the language they speak. The main question to answer is what message do you want to get across? This will help you figure out so many things for your signage like how many displays you need or the colors and text to use. Are you going to put in your menu and promotions? Do you have to change it monthly for specials? Consider those and many other aesthetic aspects. Your content should be based on your audience because the whole point is to feed them what they ordered. Determine the type of screens you want to use. Are you going for LCD screens, LED boards, tablets, mobile devices or interactive touchscreens? Your answer should depend on the availability of your space and the type of audience you have. Consult an expert hardware team so they can plot out your digital signage set up and make suggestions accordingly. Make sure that everything is ready. Mount and secure everything that has to be mounted and secured especially if you’re gonna have your signage inside the restaurant or near the windows where customers will sit. You also have to make sure a that your hardware has power and network connectivity. It is important to go through intense quality checking. Check and double check everything. See if the digital board is operational and done properly. Test and inspect all the details meticulously. Make sure that everything is working as planned. These are a few things that will help you get your digital signage together. 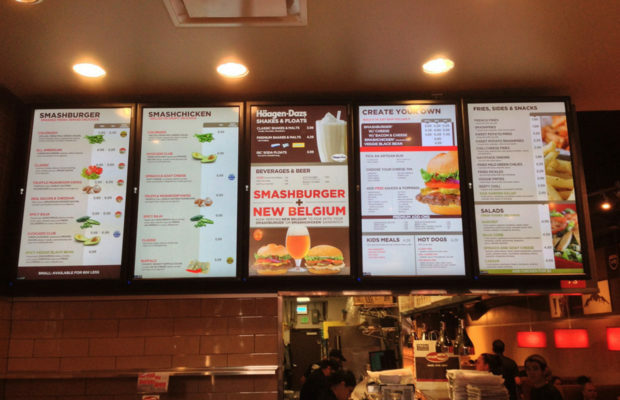 If you’re going to spend on digital menu boards, you might as well consider all that we have mentioned. You don’t just slap on a TV and put in pictures. You have to prepare for everything in order for it to be successful.